Speculations about geological time vary enormously. Estimates of the age of the oldest rocks by geologists and astronomers starting from different standpoints have varied between 1,600,000,000, and 25,000,000. That the period of time has been vast, that it is to be counted by scores and possibly by hundreds of millions of years, is the utmost that can be said with certainty in the matter. It is quite open to the reader to divide every number in the appended time diagram by ten or multiply it by two; no one can gainsay him. Of the relative amount of time as between one age and another we have, however, stronger evidence; if the reader cuts down the 800,000,000 we have given here to 400,000,000, then he must reduce the 40,000,000 of the Cainozoic to 20,000,000. 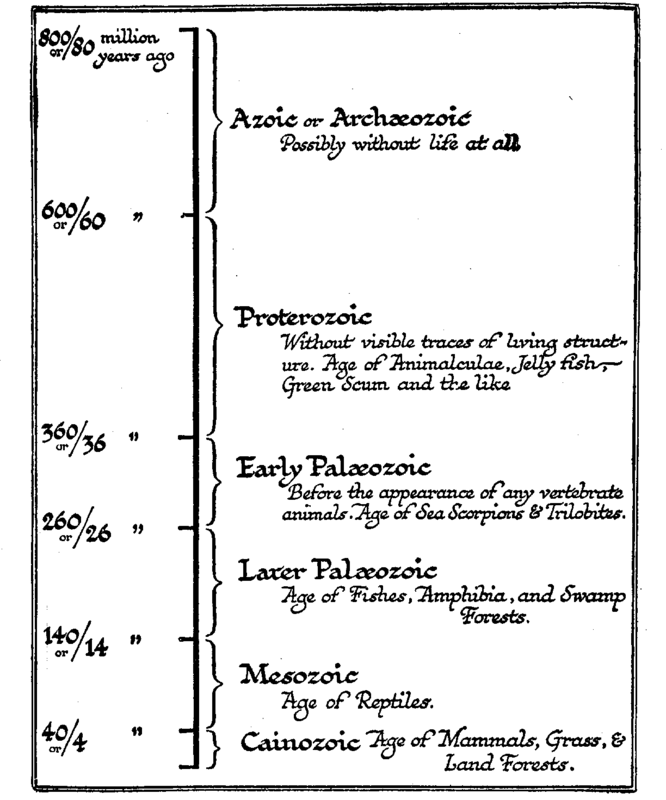 And be it noted that whatever the total sum may be, most geologists are in agreement that half or more than half of the whole of geological time had passed before life had developed to the Later Paleozoic level. The reader reading quickly through these opening chapters may be apt to think of them as a mere swift prelude of preparation to the apparently much longer history that follows, but in reality that subsequent history is longer only because it is more detailed and more interesting to us. It looms larger in perspective. For ages that stagger the imagination this earth spun hot and lifeless, and again for ages of equal vastness it held no life above the level of the animalcule in a drop of ditch-water. Not only is Space from the point of view of life and humanity empty, but Time is empty also. Life is like, a little glow, scarcely kindled yet, in these void immensities. An admirable recent book, short and written in a style intelligible to the general reader, is Arthur Holmes, The Age of Earth . He gives a good summary of this most interesting discussion, and sustains the maximum estimate of 1600 million years.